Please check out audio from India FDI Watch Director Dharmendra Kumar’s interview on New Zealand public radio. 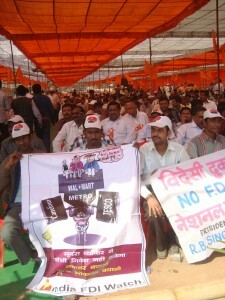 Please check out FDI Watch audio on German radio documentary on superstores invasion in India. 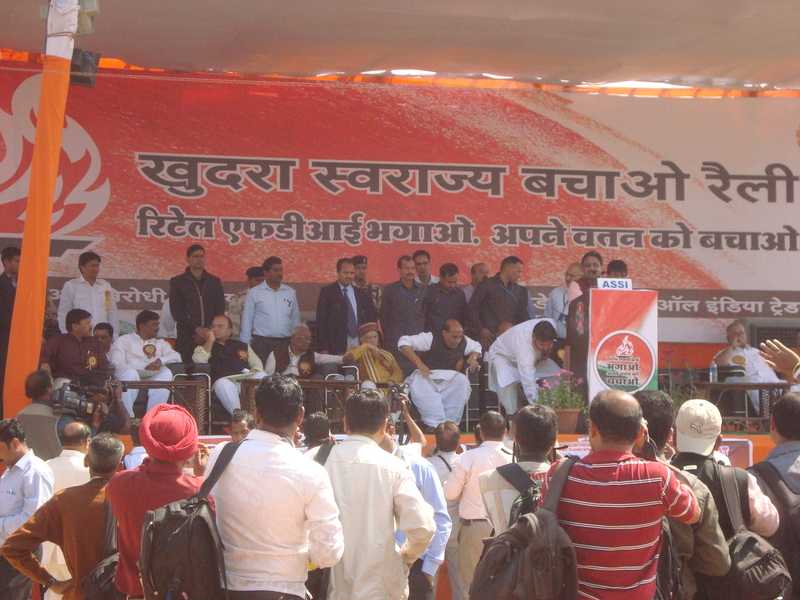 Senior leaders of different political parties and retail stakeholders joined hands together at Save Retail Democracy Rally organised on 7thMarch at historical Ram Leela maidan of Delhi. All major wholesale and retail markets of Delhi remained closed on the day. 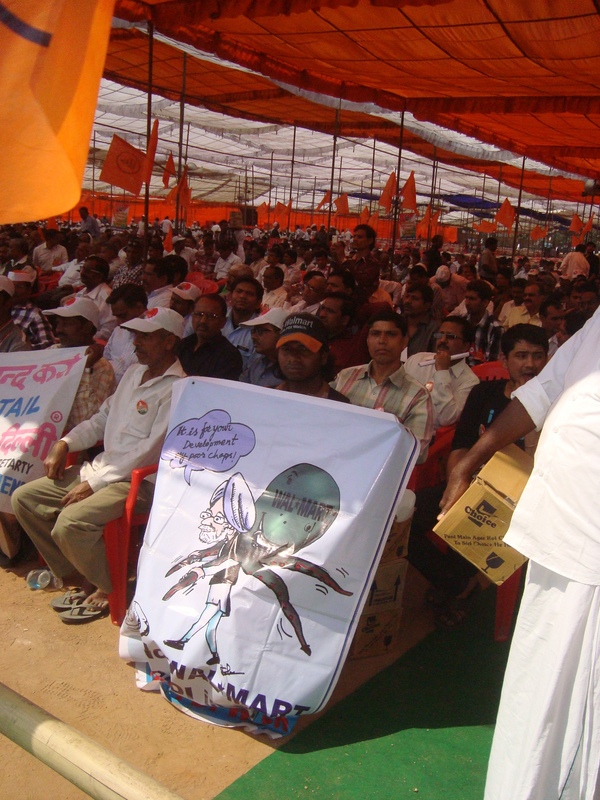 Tens of thousands of retailers, farmers, hawkers, transporters, labourers, consumers, cooperatives, small scale industries and civil society organizations participated in the rally. An anthem “Jago Apne Watan Ko Bachao-Retail FDI Ko Bhagao” (wake up to save country and chase away Retail FDI) composed by noted bollywood music director Salim Suleman and conceptualised by leading Ad Company R.K.Swami BBDO was the star attraction of the rally. Senior Leaders of different political parties including BJP President Mr. Rajnath Singh, Leader of Opposition in Lok Sabha Smt. Sushma Swaraj, Leader of Opposition in Rajya Sabha Mr. Arun Jaitley, Chairman of Public Accounts Committ ee of Parliament Dr. Murli Manohar Joshi, NDA Convener & Janta Dal (U) President Shri Sharad Yadav, Senior CPI Leader Comrade A. B. Bardhan, Leader of CPM in Loksabha Comrade Basudev Acharya, Comrade Amarjeet Kaur and Shri Pawan Kumar of central trade unions addressed the rally. 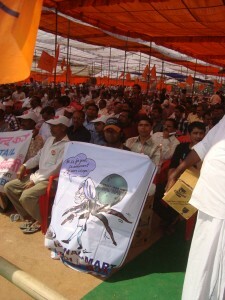 Hawkers Conference to read about our hawkers conference held yesterday in Delhi. More than one thousand street vendors gathered in the conference of Hawkers Joint Action Committee. The committee is initiated and facilitated by us. The central Minister announced for an act to issue vending licences to 2.5% of urban population. Dharmendra Kumar’s article on the Food Security Bill published today in Hindi Daily Prabhat Khabar. “Mr Doug McMillon, CEO Walmart International met Union Commerce Industry and Textiles Minster Shri Anand Sharma at Davos today and conveyed that Walmart is `excited about India’ and they are studying the conditions before making the final announcement. Swedish furniture manufacturer IKEA is the latest retail store set to expand into India. The government wants to attract much-needed infrastructure – while many shop owners fear for their livelihood. For a long time, India had very restrictive rules on Foreign Direct Investment (FDI). But in the last couple of years, restrictions have been loosened. In June, 2012, the government made some changes to its policies, allowing foreign retailers to operate with less restrictions in the country. This, according to Gareth Price, a Senior Research Fellow at the British think-tank Chatham House, was aimed at building up much-needed infrastructure in particular in the agricultural sector. 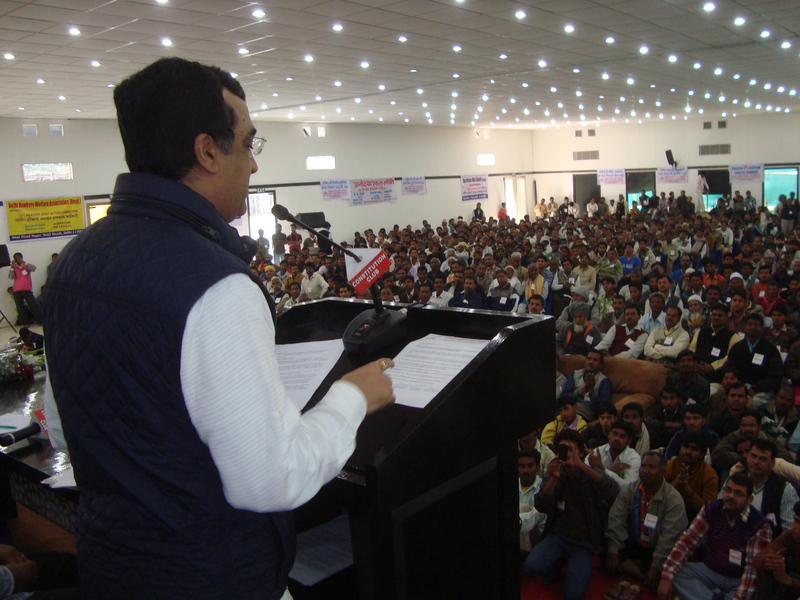 “India’s supply chain management is very poor. A lot of food is wasted before it even reaches the shops,” Gareth told DW. India, he added, lacked the resources to improve its infrastructure – the reason the ruling Congress Party decided to open the country to foreign investment. Several foreign companies, including Wal-Mart, were quick to set up shop following the liberalization. In November, the government went even further, allowing for full ownership of local subsidiaries by foreign companies. Previously, foreign ownership had been limited to 51 percent. Furniture manufacturer IKEA is the latest international retailer set to expand into India. On Tuesday, January 22, an Indian Commerce Ministry official said that the Investment Board had approved the Swedish company’s 1.9-billion-dollar investment proposal. IKEA announced it planned to open 25 stores in India over the next 15 to 20 years. The Cabinet, however, has yet to approve the bill and some Members of Parliament have already voiced their opposition. The opposition BJP party said that it would reverse the decision after the next elections, Price from Chatham House said. The issue of foreign investment is highly divisive. Many Indians, Price said, fear that hundreds of thousands of jobs might be lost in the retail sector, one of the biggest employers in India. It was only a matter of time, he added, before foreign companies would start to have an impact on supply chains, dictate prices and force small- and medium-sized producers out of business. Amita Arora Puri from the All India Artisans and Craftworkers Association takes a less bleak view: IKEA with its “unmatched funds and global expertise” could help local artisans and traders to improve their designs, product quality and production abilities,” Puri told DW. The Union cabinet led by the Prime Minister today approved the one man commission inquiry on Walmart lobbying in India. The inquiry Commission would be set up under the Commission of Inquiry Act, 1951 and would submit its report within three months of its constitution. As per this act it would be obligatory for the Govt. to table the inquiry report and action taken report in the Parliament. The terms of reference of the Committee are as follows:-(i) To inquire into recent media reports on disclosures of Wal-Mart before the US Senate regarding their lobbying activities and details. (ii) Whether Wal-mart undertook any activities in India in contravention of any Indian law. (iii) Any other matter relevant or incidental to the above. The Supreme Court today said that interest of small retail traders should not be affected due to foreign direct investment (FDI) in retail sector and sought response from the Centre on how it intends to safeguard their interests. A bench headed by Justice R M Lodha asked the Centre to file its response within three weeks. 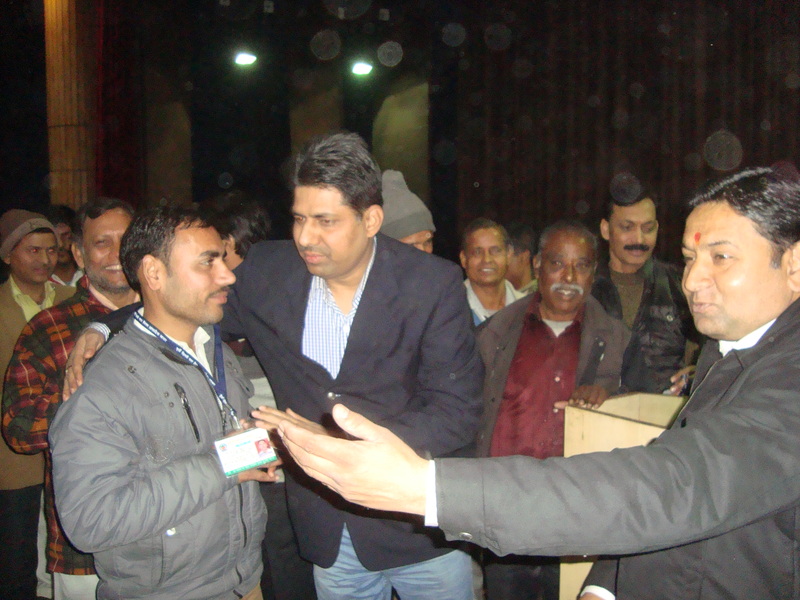 East Delhi Municipal Corporation today inaugurated the Identity card distribution to hawkers of Weekly markets. Mr. Sunil Jha, Chairman, Licensing and Tehbazaari Committee, EDMC distributed the Id cards to hawkers (photo attached) at the program organized at EDMC headquarters. The Hon’ble Mayor, Standing Committee Chairman, Leader of the House, Leader of the opposition and many of the Councillors were also present on the occasion. Later, we held a meeting of hawkers in the EDMC park. A National Convention against FDI in Retail is being organized on 16th January at NDMC ConventionCentre, Parliament Street, New Delhi. Senior leaders of various political parties are expected to join theconvention including the leader of the opposition Smt. Sushma Swaraj, NDA Convener Sh. SharadYadav, CPI Secretary Comrade A B Bardhan and the senior BJP leader Sh. Murli Manohar Joshi. President and General Secretaries of small retailers’ federations from across the country will be participating inthe convention. Along with traders and hawkers leaders of Delhi leaders from Punjab, Haryana, Himachal Pradesh,Maharashtra, Tamil Nadu, Andhra Pradesh, Madhya Pradesh, Uttar Pradesh, Kerala, Rajasthan etc. are joining the convention.